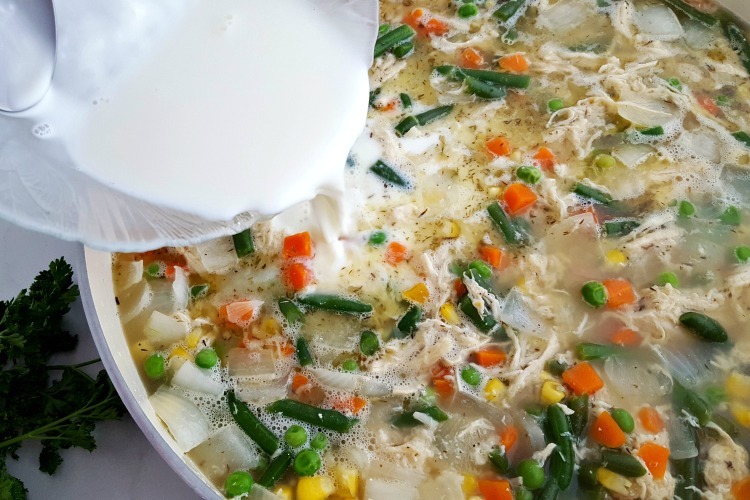 Do you want the best gluten free chicken pot pie casserole recipe for family dinners? This easy recipe uses a delicious crust and yummy filling families love. When I first went gluten free, there were so many things I missed! I’ve replaced most of them with new favorites, so I decided it was time to make a gluten free chicken pot pie casserole. I have a double crusted chicken pot pie recipe that is delicious. Sometimes we need more than just a pie dish, so I decided to make it into a full sized casserole so we could feed more people. 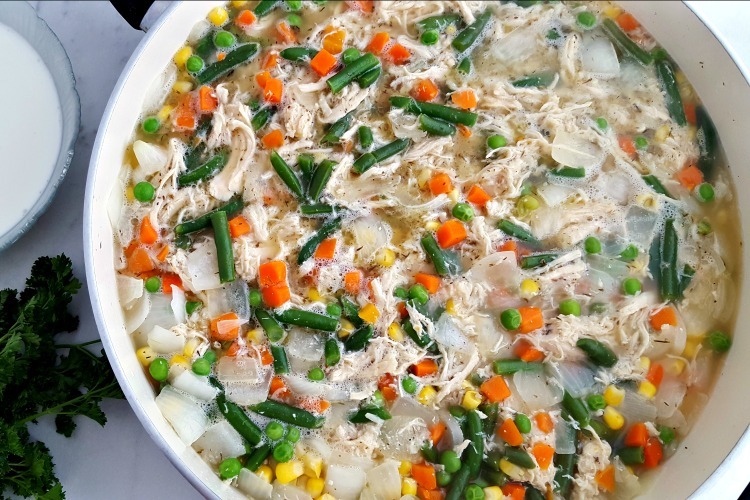 This gluten free chicken pot pie casserole has all of the yummy flavors that we grew up with, only without the gluten ingredients that so many of us have to avoid now. You won’t even know the difference. 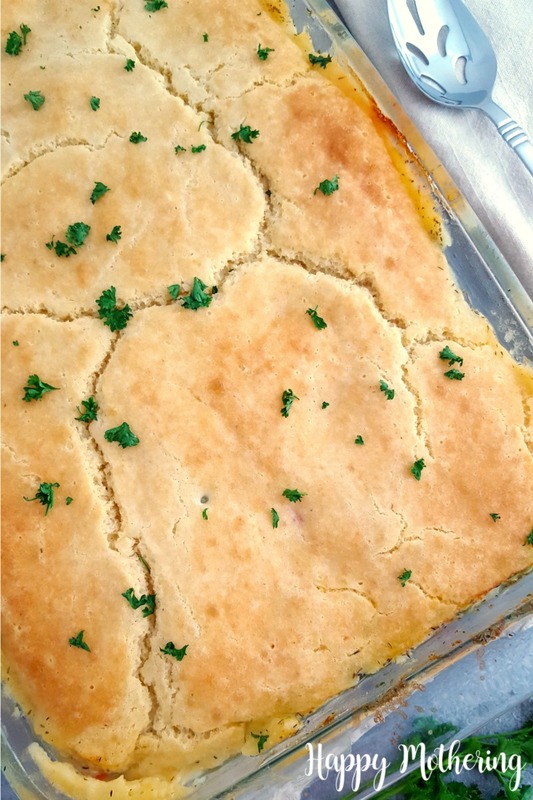 If you’ve been searching for the best gluten free chicken pot pie casserole, here is the recipe. Be sure to let us know how you liked it in the comments! In a 4 quart saucepan, add a tablespoon of oil or butter and the chopped onion, then cook until translucent. Stir in chicken, frozen vegetables, chicken broth and spices. Turn up heat to allow the mixture to come to a boil. In a small bowl, add the milk and cornstarch, then whisk until smooth. Stir into the chicken pot pie mixture on the stove. Continue boiling until the liquid has thickened. Taste and adjust seasoning, if needed. Remove the pan from the heat and pour the chicken pot pie contents into an ungreased 9 x 13” casserole dish. In a separate bowl, add topping ingredients and mix well. Spoon topping over the chicken mixture and smooth out to cover the surface. Bake your gluten free chicken pot pie casserole for 25-30 minutes or until a toothpick inserted into the center of the casserole comes out clean. Sprinkle with fresh parsley as garnish, if desired, and serve while hot. 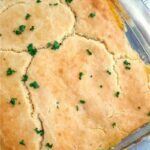 Do you want the best gluten free chicken pot pie casserole recipe for family dinners? This easy recipe uses a delicious crust and yummy filling that families love. 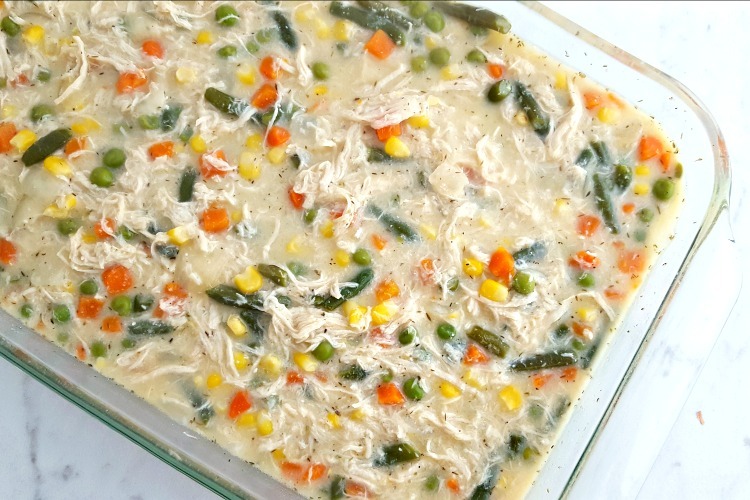 Let us know your family liked this gluten free chicken pot pie casserole in the comments below!